WASHINGTON — A report released by the Department of Homeland Security on Monday, (22 May) revealed that an estimated 629,000 visitors to the United States have remained in the country after overstaying their visas. St. Kitts and Nevis as well as other regional and international countries are featured in the report. The 629, 000 visitors account for just over 1 percent of all travelers. They consists of students, workers and tourists. Of the 12,115 nationals of St. Kitts and Nevis that entered the US for business or pleasure between October 2015 and September 2016, 280 overstayed their authorized admittance period, one of the lowest overstay rates out of the six independent OECS countries. Therefore Less than 3% of St. Kitts and Nevis nationals who traveled to the United States on visitor visas in 2016 overstayed the time authorized by US immigration. The U.S. Department of Homeland Security (DHS) on Monday (May 22) released its “Fiscal Year 2016 Entry/Exit Overstay Report” which provides data on foreign visitors who overstayed their period of admission in the United States of America. According to the DHS report, 18 St. Kitts and Nevis nationals departed the US after their lawful admission period expired, and 262 who overstayed their legal stay are suspected to still be in the country. As it relates to those who entered on student visas, of 225 that were expected to depart the US, 6 departed after their permitted stay, and 6 are suspected to still be in the country, for a total student overstay rate of 6.67%. With a total visitor overstay rate of 2.31%, St. Kitts and Nevis was second behind Antigua and Barbuda with 244, Dominica had 291, Grenada 340, St. Lucia 351, and St. Vincent and the Grenadines had the most overstays with 362. For the fiscal year 2016 Homeland Security estimate that almost 740,000 non-immigrant visitors overstayed in the US, with 287,107 originating from countries which require visas, and 79,818 who entered the US to study. The Department of Homeland Security says identifying overstays is important for national security, public safety, immigration enforcement, and processing applications for immigration benefits. 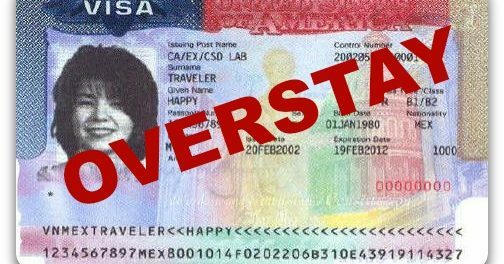 While overstaying in the US is not a criminal offence, persons who overstay in US for more than 180 days but less than one year after their authorized period of stay has expired, can be barred from re-entering the country for three years from their date of departure. Those who overstay for more than one year can be barred for ten years. These penalties only apply to persons who leave the US prior to the commencement of any deportation proceedings. According to a New York Times article, two of the Sept. 11 hijackers, Satam al-Suqami and Nawaq Alhazmi, had overstayed their visas. The report is the second issued in the last 20 years. According to Ron Nixon, the agency responsible for investigating in country overstays, had to piece information together from dozens of systems and databases, some of which are not integrated and does not share information electronically. The new report comes as the Trump administration accelerates its efforts to deport undocumented immigrants.